At a long table sat seven directors. Three more sat on a ledge behind them. A camera stood on a tripod, pointed at a whiteboard. A group of girls entered the room with their audition sheets in hand. Addressing the girls, Rizky Rahadianto ’15 introduced himself and the rest of the directors as members of WesFlix, the Sophomore Film Coalition. He explained that there were 10 scripts, each with different stories, and gave the directors a moment to pitch their ideas to their potential actors. “Mine is about a kid that hacks a file from the government and the two government agents that go after him,” said Will Slap ’15. The auditions, open to all Wesleyan students, aimed to cast roles in 10 short films that are written, directed, produced, and edited by the 20 members of WesFlix. WesFlix was founded last year by Sam Gilberg ’14 and Alice Lee ’14 as a way for sophomore film majors to collaborate on projects independently of the Film Department. During its first year, the coalition had 15 members and produced 11 short films, culminating in a showcase last May. This year, Rahadianto is acting as head organizer of the coalition while also working on his own short film. He explained that the group’s focus is to create a sense of community among burgeoning film majors and to facilitate creativity. 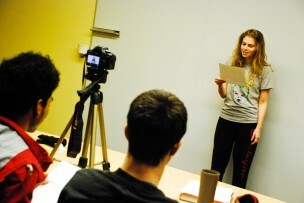 After discussing ideas during the fall semester, WesFlix decided on the theme of “Revisiting” to tie together its 10 five-minute projects. After the directors each decide whom to cast in their films, they will each take two days to film using a shared pool of Digital Single-Lens Reflex (DSLR) cameras, tripods, and borrowed lighting equipment. Wyzan said that the small size of the productions forces the members to work together in various leading and supporting positions. Among the 20 members, jobs vary from filming and directing to working props, operating the makeshift dolly, or even just holding the boom mike. According to Rahadianto, the coalition will help sophomores interested in film bond as a class, and will emphasize the importance of collaboration in creating a larger product. Gilberg echoed this sentiment. “A film set is just a group of people with the same goal coming together,” he said. Given that sophomore film majors have likely not taken many production classes yet, WesFlix offers them the opportunity to learn from experience. Each WesFlix film reflects not only the vision and style of its screenwriters but also the input and influence of the rest of the coalition. This emphasis on cooperation is reflected in the interview-like process of auditions, which are held for all 10 projects at once. That format allows the directors to collaboratively test potential actors with snippets from their scripts. “Cold and angry,” Slap said. Dan Fuchs ’15 was next to request a test. Agresti looked into the camera. An array of emotions flashed across her face. Her hands clenched and unclenched and she smiled unnaturally, running her hand through her hair. The directors thanked her and brought up the next prospective actor. The tasks required for each person’s audition varied slightly, as each director determined whom he or she wanted to test and for which part. “In 10 seconds, illustrate a character who is manic and schizophrenic but reserved,” Fuchs said. “Can you seem awkward, nervous, like you’re psyching yourself up to talk to a boy?” Ananya Menon ’15 asked. “Would you be willing to shave for roles?” Menon asked two male students. Only one of them said yes. Similarly to last year, WesFlix plans to have all its films in the editing process by May and hold a screening in Film Hall at the end of the semester. By sharing its independently produced projects, WesFlix hopes to contribute to and involve itself with the greater Wesleyan community. Of course, WesFlix also serves as a vehicle for the creativity and ambition of its members. Beyond fostering community among the film majors, WesFlix aims simply to give its members their first experience working with a film from its inception to its debut.